Seed Planting in General: Increase germination rates by planting seeds at the correct depth. 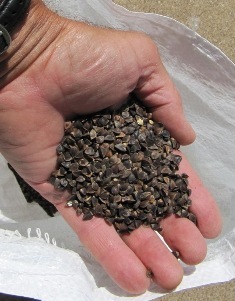 As a rule, seeds should not be buried any deeper than their diameter. Forget the quarter-inch planting depths you see on many seed packets. That's too deep for all but the biggest seeds, such as peas and beans. Some seeds even need light to germinate - don't bury those at all. Always plant in freshly disturbed soil. Seedbed should be firm after planting but not compacted. Don't plant too deeply. Use fertilizers and amendments that develop strong root system. Cover these seeds with soil: Beets, Broccoli, Cabbage, Cauliflower, Celery, Chards, Cucumbers, Melons, Okra, Onions, Parsley, Peas, Radishes and Spinach. Sow these seeds on top of the soil for best germination: Ageratum, Astilbe, Balloon flower, Cleome, Coleus, Coreopsis, Dill, Impatiens, Lettuce, Mexican Sunflower, Ornamental Peppers, Petunias, Savory Shasta Daisy, Snapdragon, Strawflower Stock, Sweet Alyssum and Yarrow. Soaking Seeds: Prior to planting, soaking seeds can speed up germination and increase germination rates. Some small, hard seeds need to soak 12 to 24 hours, while other seeds (peas and beans) are higher in protein and absorb water quite easily and should be soaked for only 2 to 4 hours. Garrett Juice can be added to the soaking water, but the soaking should be reduced to less than an hour. Tiny seeds clump together when wet, so pre-soaking can make them very hard to handle. Avoid this by soaking them for a while and then drying them on paper before planting. Seeds can also be sprayed with Garrett Juice Pro prior to planting to inoculate with microbes and to provide a mild fertilizer coating. If the ground is saturated, there is less reason to pre-soak seeds. If the soil temperatures are less than 50 degrees, it is less important. Seeds being planted into heavier, slower-draining clay soil don't need to be pre-soaked because seeds can rot in heavy, wet soil. 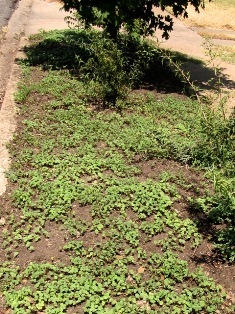 Buffalograss is the toughest and most drought-tolerant of all turf grasses. 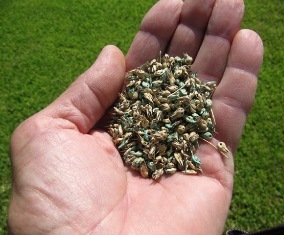 Critics say not to use buffalograss because Bermudagrass will invade and take it over. That's probably true if synthetic fertilizers and over-watering is the program. The key to establishment from seed is raking the seed into the soil and watering several times a day until small seedlings have begun to grow. The organic program also helps greatly. It's a great time to plant now. This grass will save you a lot of money. Once established, it can survive with almost no water.